Hey lovely people, how are you all doing? Let me tell you a thing about myself. Way before I knew about makeup and I came in this industry the only things I used to own were lip-glosses and nail polishes. I am still crazy for lip-gloss and I use it every single day. But, with time my love for Nail polishes went dormant and I didn’t really buy any. I also think in this 4 years of blogging I haven’t reviewed enough nail polishes. One fine day I was dreaming of applying a sparkling silver nailpaint on my nails and trust me guys I received the exact same nail polish from DeBelle Cosmetics on that day itself. I had no idea about it and how it happened. The shade I received is Sparkling Dust. So, without further ado let’s jump right in. 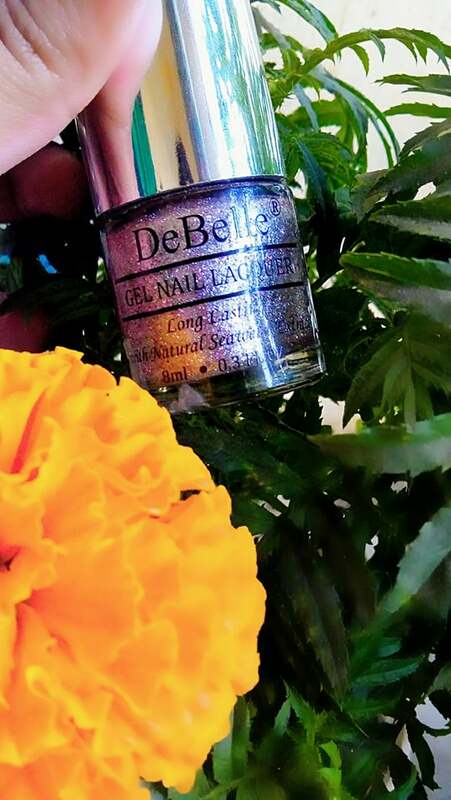 About DeBelle Gel Nail Lacquer (Claims): DeBelle Gel Nail Polish is a gel based, high-pigmentation formula which makes the nails to look beautiful and bright .These are available in the latest trendy colors with both matte and glossy finish. 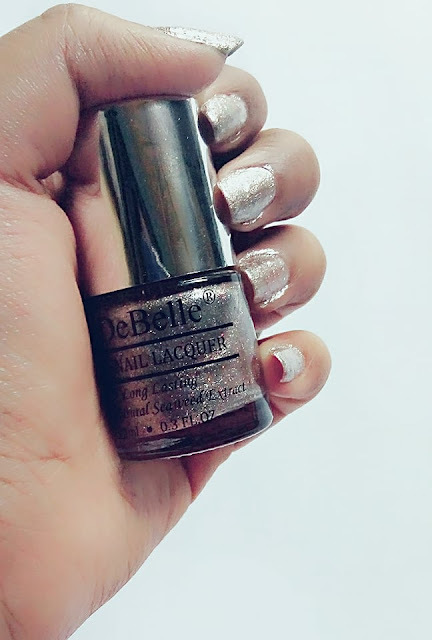 DeBelle nail polish as unique feature of long-lasting stay with gel base formula. Also it does not require UV light. It contains natural Seaweed Extract that helps to promotes nail growth and lets your nail to breathe. Apply two coats for long lasting results and shake well before use. So get your professional gel finish manicure right at home. Sparkling Dust is a Glitter nail polish which has shimmering and bling effect and which can give you glamorous yet sophisticated look. 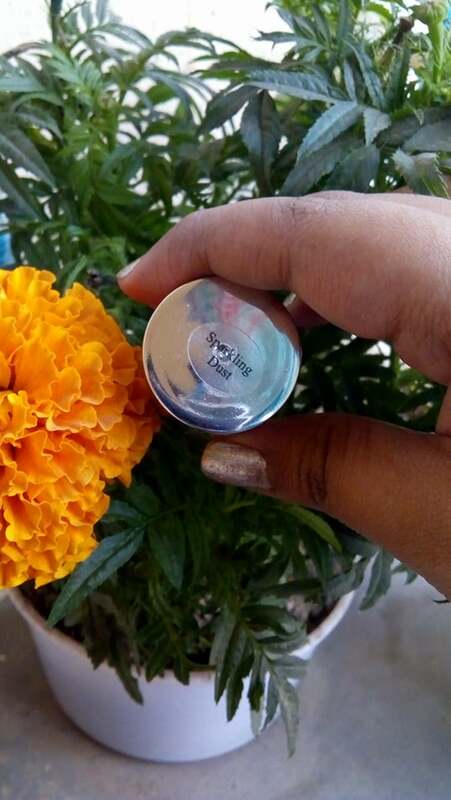 Packaging: This comes in a rounder nailpaint bottle which is transparent and a silver cap. The shade name is written on the top of the cap. The rest of the details are printed on the bottle. 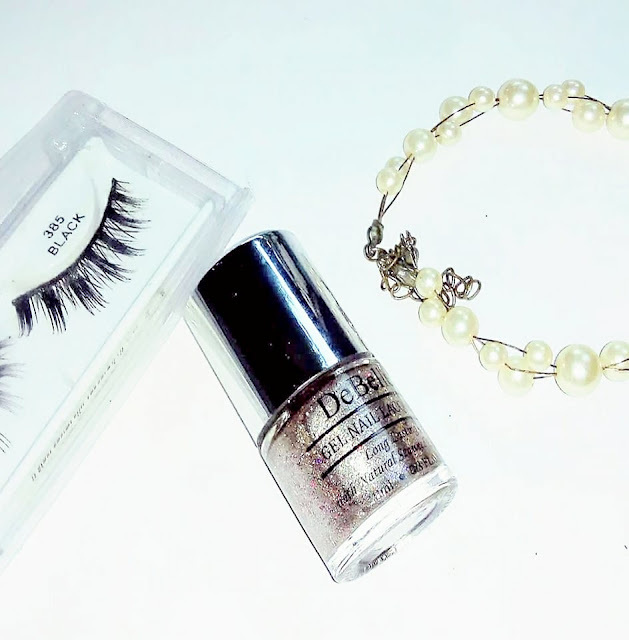 Product: The shade I received is Sparkling Dust and as it’s name suggests is a silver nail paint full of sparkles. The applicator is quite wide and covers quite a part in the first time. My Experience: Even though my love for nail polishes went dormant with time but now it’s alive again. I jumped with joy when I received this nail paint because of my strange magical coincidence. Anyways, now how did this perform? To be honest, I’m quite surprised at it’s performance. I’ve Never seen a gel nail lacquer stay on your nails without chipping for more than a week. I’m not even kidding guys. Being a science student I work in the laboratory three days a week. Even amidst using all the instruments and chemicals my nail paint stayed as it is. It is quite difficult to remove with the regular nail paint remover instead it feels of after a while. The color is pretty opaque and you can build it as per your choice. It’s a metallic silver paint with multicolored sparkled. If you have a function to attend and you don’t have enough time to get a manicure then just apply this. It will look like you have spent hours and a lot of money on your nails. This is all I’m wearing these days and I’ve got a lot of compliments on this. I usually apply a top coat as I don’t really like the rough texture. I like my nail paints to be smooth and glossy. Since it contains seaweed extract it hardens the nail preventing it from breaking off and also promotes growth. I quite love the nail polish and would love to try out more from them. 4. Contains natural seaweed extract. I quite love the nail paint and I’d love to try out more from them. This is definitely a must try.